Richie Stephens the famous singer and producer, which won a grammy awards, heralds the beginning of a new collaboration, a project with artists from Salento Rankin Lele and Papa Leu. The project name is: Richie Stephens & SkaNationBand. The first album "Internationally" will be available starting from April 15. 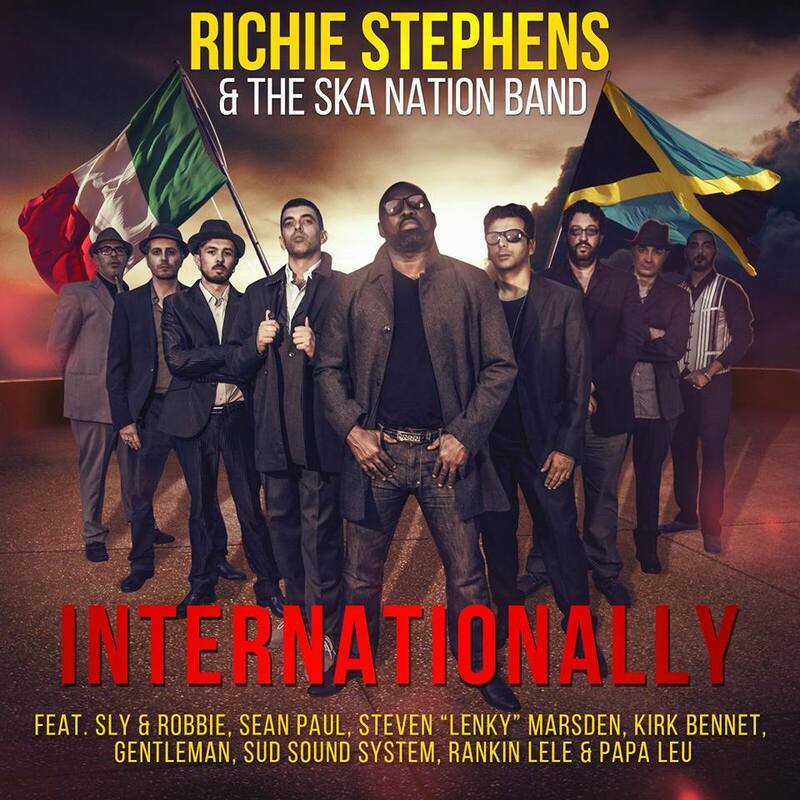 "Internationally" is a real homage to the Ska genre. The album features 14 tracks. The link between the Jamaican singer and SkaNationBand, took place in Italy at the Festival of Casalabate. The artistic and creative feeling was immediate. The single Kingston Salento" highlights the connection and love for ska globally from the Adriatic Sea to the West Indies. The album has been recorded partly in Italy and partly in Kingston jamaica. 'Internationally' it is above all a symbol for love of Ska music and the emotions that it make arise. Many collaborations are included in this album, Sean Paul, Gentleman to Sud Sound System, they will make you hake your body. This recording gathers the contribution of some great musicians of international reggae like Cleveland "Clevie" Browne, Dean Fraser, Kirk Bennett, and the valuable support of the great Stephen "Lenky" Marsden. Richie Stephens and SkaNationBand were able to create a great working team. Staring from the musical arrangements to the lyrics, "Internationally" it will certainly make all the fans of the genre very happy. 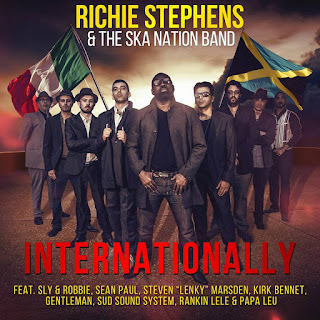 "I wish that anyone who listen to the album will realize by himself that Ska is a very serious thing, that can be on top of the charts as it was before if he is granted an opportunity to be revived as has already happened in the past", explains Richie Stephens. Ita: Richie Stephens - noto cantante nonchè produttore giamaicano ed anche vincitore di un grammy awards - preannuncia l'inizio di una nuova collaborazione che prevede un grandioso progetto con gli artisti salentini Rankin Lele e Papa Leu, dal nome: Richie Stephens & SkaNationBand Il nuovo album "Internationally" è fuori dal 15 aprile ed è già primo nella classifica Ska di iTunes in America, e nella top 100 in Giappone, Germania e Italia. "Internationally" è un vero e propio ossequio al genere Ska. L'album è composto da 14 tracce; la connessione tra il cantante giamaicano e la band SkaNation, è avvenuta in Italia al Festival di Casalabate, che ormai da tantissimi anni è un cult sulle coste del salento. Il feeling artistico e creativo è stato immediato. Il singolo “Kingston Salento” evidenzia una certa connessione e l'amore per lo ska a livello globale dal Mar Adriatico fino a quello delle Antille. Gran parte del disco è stato registrato ed arrangiato nel Salento, metre il resto negli studi di Kingston in Giamaica. Le collaborazioni in questo album sono svariate: da Sean Paul e Gentleman ai Sud Sound System, ad alcuni grandi musicisti del reggae internazionale come Cleveland "Clevie" Browne, Dean Fraser, Kirk Bennett e il prezioso supporto del grande Stephen “Lenky” Marsden. Insomma Richie Stephens e la SkaNationBand sono stati in grado di creare un grande gruppo di lavoro: dagli arrangiamenti musicali ai testi, “Internationally" sicuramente renderà orgogliosi gli appassionati del genere. "Vorrei che ognuno che ascolti quest’album possa rendersi conto da solo che lo Ska è un genere molto serio, che può rimanere in cima alle classifiche se gli viene concessa nuovamente l'occasione giusta per essere riportato in luce come è già successo in passato", spiega Richie Stephens.